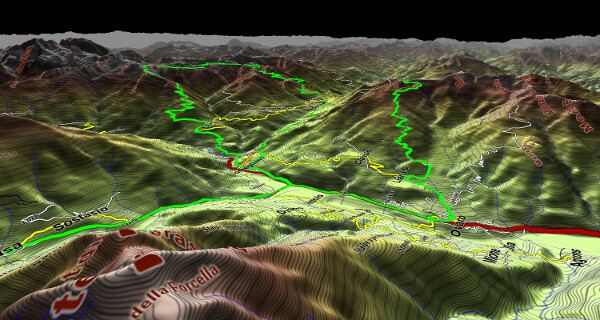 The BergTourenPlaner (BTP, English: climb tour designer) is a offline tool to plan tours, estimated power output, estimate time tables for a given route, find tours with the highest/least altitude gain, find climbs and create 3D-views. BTP is an open source project combining open source road network data of OpenStreetMap and the SRTM3 digital elevation model of the NASA. The contents of climbindex.eu were generated with BTP. To enable BTP full function volume you should download some *.hgt files containing the SRTM3-data and store in any folder. This folder has to be specified under 'Settings->SRTM3 data folder'. This source of void corrected data is recommended. Once BTP finds valid *.hgt-files in the specified folder, it will render the map new, a blank topographic map should appear. If no elevation data for the current coordinates was found the window might be unchanged. You may go to you region of interest pressing 'g'-key and enter your desired coordinates. E.g. you should download these hgt-files, press 'g' and type '46.5 12.92' to center the Monte Zoncolan. Now you may click on any road on the map an a green point will appear, the start point of your tour. Clicking on a another point the shortest track will be routed and displayed. If you move along the track there appear black and yellow circles. You can drag-and-drop the black ones and fix the track by clicking the yellow ones, which then form to black circles. Delete the track with ESC or delete key. Shorten it with backspace. Save this track with 'Track->save btr' and reload it with 'Track->load btr' to modify and plan another time. You may use the Power Analysis to investigate a gpx-file, independend of any btp-files. 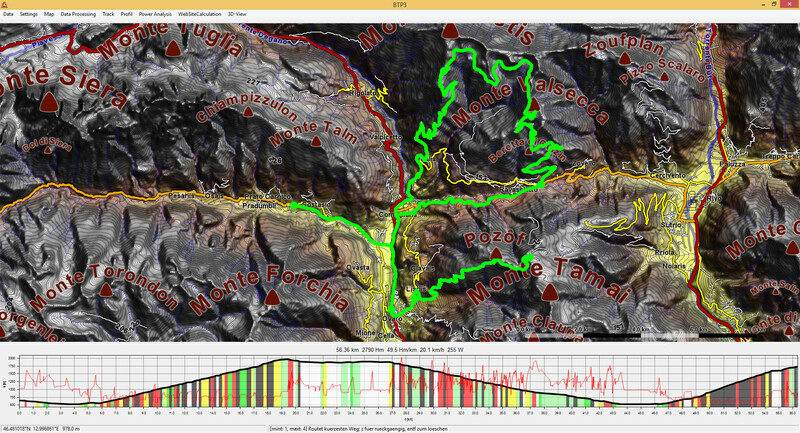 Use 'Data->Analyse gpx'. You can use 'open with' or command argument handling with BPT, accepting both gpy and btp file. If the program does not start any more, try to delete the settings.stg file within the application folder. ↵ (enter) start an "open end" routing. Lock a previewed track pressing 'n', accept it with a further enter press. Or just click by mouse instead. 0,1,2,3,4,5 set allowed track type: 0 motorway, 1 national highway, 2 main road, 3 side road, 4 small road (usually still tarmaced), 5 untarmaced tracks, possibly still ridable with a race bike. Pressing atditional ctrl sets the minimum type, without ctrl set the maximum type. n toggles preview: within any routing mode you have the possibility to press ENTER instead of choosing an end point with mouse. You then can move the mouse over the map and the specified track will be shown instantly. press 'n' to lock this view or unlock. Press Enter or click with the mouse to accept this track. Data→save btp saves all loaded map data, which is currently shown. Zoom and move the map (and reload the data subsequently) to cut the data to the desired region. Cutting an existing dataset is the most important thing you should consider when aiming for faster operation of BTP. Data→read osm reads a *.osm file and generates map data from it. This task may take up to an hour time. osm-files up to an 2 Gb may be read. There size of your available memory should be at least as big as the osm-file. Settings→btp startup file choose a file which automatically should be loaded when BTP is started, or press cancel so that this is not the case. You may rather prefer to maintain a folder with btp datasets, which you 'open with' BTP, as BTP accepts command arguments. You can specify the algorithm and the constraints of data set for all routing modes based on the STRONG-algorithm, i.e. the m-,c- and s-mode. First a restriction of the dataset can be achieved. For that purpose the ellipse with the start and the endpoint (if endpoint is not give the start refers as the end) is specified by the maximum distance to these two points. The distance may have an absolute contribution (data radius absolut (km)) and a relative contribution depending on the air-line distance of start- and end-point ('data radius factor' times air-line distance gives the relative contribution). It is important to limit the data area to not run out of memory during a STRONG calculation. Second the precision of the calculation can be set which strongly influences the needed amount of memory. First there might be an assumption about the maximum Hm. It is the (hm/km max)*Radius with the Radius calculated from data ellipse, but 'hm max' maximum. The lower the 'hm steps' value the more precise the calculation will be, but with higher demands on memory. Basically the s-,m- and c-routing modes call the same routing procedure, the output only depends on the specifications done in that dialog. Data Processing→Create Stronglayer If a STRONG calculation is finsihed you may have the possiblity to generate a STRONG layer, showing how often a road segment is used when investigating the most demanding tracks. Data Processing→invert height data switches the direction to road segments. A STRONG calculation then will rather lead downhill. This might be interesting if only the endpoint of a hm/km-optimized tour is known. Data Processing→normalize height data The total accumulated elevation gain of the road segments is equalized in forward and backward direction, so that for a STRONG calculation both directions are attractive. Data Processing→save STRONG calculation You may experience, that a STRONG calculation takes a lot of time and gains a lot of information. Before hitting the ENTER-key you maybe want to store the whole calculation. This can produce several Gb of data, but saves you a lot of time. A Strong-Calculation belongs to its btp-file. Data Processing→Load STRONG calculation Load a finished STRONG calculation. After the data is loaded you can continue as a calculation just had finished. The related btp-file has to be loaded before. Data Processing→correct hgt files your SRTM3 data maybe contains voids, which result in deep holes in the topographic map. You can correct this hgt-files using this command. the void will be linearly interpolated. Data Processing→swap Hm and distance Imagine you want to calculate the pareto optimal set of routes which have the longest distance with the least altitude gain - this is the inverted STRONG idea. You can invert the data to achieve this goal. Track→save btr saves the track to reload another time with BTP. The btr belongs to its btp-file. Track→load btr loads are previously designed track. The related btp file has to be loaded. Profile→save Profile as png exports a profile of the current track as specified in the settings. It looks as in the Profile Window, but gets the specified dimensions. At first it hast to be mentioned, that you can cut an existing data set any time you want with 'Data->save btp', which will save only the data shown on the current map. If the sample data on the Download page is not sufficient for you, you soon want to create your own dataset. now type 'osmconvert.exe A -b=C,D,E,F -o=G', substituting A by the *.osm.pbf filename, C,D,E,F by minimum longitude, minimum latitude, maximum longitude, maximum latitude and G your destiantion filename *.osm. The file extension .osm is important. Load the osm file in BTP with Data->read osm. Insure yourself that SRTM3 data was specified with 'Settings->SRTM3 data folder'. In principal there is no limitation of size for the osm-file. This strongly depends on your memory capacity. The available Memory should be atz least as mush as the size of the osm-file. You can merge datasets by just loading the corresponding btp-files and save them to an new merged file. 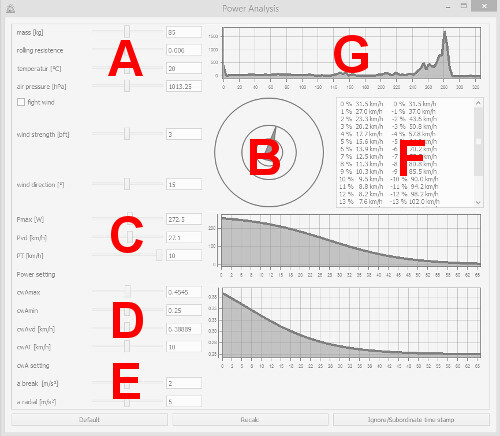 Based on either a given time stamp or the P-v-specific of the rider (which can be adjusted in C, see picture above) the average power output of the rider is calculated, given the environmental parameters given in A, B, D and E. Power analysis is executed every time a track is modified or loaded. To avoid this, close the Power Analysis Window, because for slow computers or long tracks the calculation is time consuming. The Poweranalyses simulates necessary breaking due to sharp bending of the road. You can define a maximum radial acceleration and a maximum break acceleration, from which the maximum velocity is calculated, the rider is allowed to ride. In practice this applies especially in downhill sections. and average velocity but also about how the power is used. Eflat is the energy you would need to ride at this speed an a flat road. Ebrake is the energy which is lost due to braking (and subsequent acceleration). The remaining energy is wasted in the broad velocity distribution the rider is forced to due to winds and mountains. For more information have a look here. In plot g a histogram is shown indicating, how mush time was spend at a specific power. To understand the handling of the 3D-View some basic things have to be mentioned. A 3D-View is defined by the camera position (latitude/longitude/height), the viewing direction (elevation/azimut) of the camera and its zoom. You can define parameters of the environment (superelevation,fog) and picture size (width/height). Based on this Data it is possible to assign every pixel of the picture a point on the map. To colour the 3D-View this map has to be known and is pre calculated as the texture. You might change the 'Map->settings' or change the track, now you want to update the 3D-View. This actually means updating the texture by pressing 'retexture'. If you only want to change camera position or fog or super elevation 'render' is sufficient. When pressing '3D-View->show 3D' an default view will be rendered. It represents the view from bottom left corner of the map to the top right corner. If you see nothing, you should first try to set the 'height pos' to a reasonable value. If you enlarge the picture size you also see more. Once you see the terrain you can define a new camera position by left-click onto the picture. With right-click you can define the point where the camera should look. Of course you can type the related parameters by hand. When you are satisfied with the picture composition you can adjust the texture. You can increase the 'Texture Megapixel' value as far as your computer allows. For a nice view you may turn off the scale in the 'Map->settings'. The fog can be defined by two values. The offset specifies a distance (in meters) where no fog at all should be considered. All terrain within this distance shows full saturation of colours. Pixels beyond this offset are desaturated exponentially with respect to its distance.